Just two days ago we returned from the craziness that is family, holidays, & travel. So while all of you were settling into 2015 & making your resolutions, we have just removed our Christmas tree. I wanted to make sure and document this Christmas because it was our first spent in our own home! Since we live away from our families, we have always traveled for Christmases past, but this year we really wanted to do things differently. We were ready to wake up in our own beds, and to open presents around our Christmas tree. To start new traditions! Christmas Eve we went to an early evening Mass which was just packed! We sat up front where the choir normally is just to have a seat! So we were front & center... exactly where you want to be with a toddler. Liam did as well as he typically does in Church, so I guess I'll consider it a win. The service was long, so we snuck out after communion...shh! That evening we feasted on fresh crab legs & muscles! A huge seafood feast reminding us of our days in Seattle! I think seafood for Christmas Eve dinner may be a tradition we continue. It was buttery finger good! Then it was popcorn & The Grinch to finish out the night! We laid Liam in bed and told him Santa was finally coming that night, and the following morning we would get to open all those presents he had been eyeing under the tree! He fell asleep quite quickly (thank the Christmas angels), so Conor & I (mostly Conor, with supervision by me) had plenty of time to set up his big gift! We then had some late night snuggles on the couch and talked about how special it was to be in our home for Christmas Eve. We were both little kids, just giddy with excitement at what the next day would bring! ...a brand new parking garage for all of his cars! Ramps, gas pumps, & an elevator! (Note: Just a couple days before Christmas, Liam decided to officially start asking Santa for trucks & a scarf...luckily Santa was already prepared & was able to deliver)! He was plenty busy playing with that which gave me time to make some tea, get breakfast cooking, and start a turn on the fire! It's my family's tradition to open gifts one at time, starting with our stockings. Every single stocking stuffer is wrapped which makes the whole process last all morning. Liam was fairly good at being patient when it wasn't his turn, but sometimes would rip open the wrapping paper just a teensy tiny bit while waiting! After opening each gift, he wanted to put it to use immediately! We spent lots of time in his playroom with the new train and reading new books. I love how slow paced our morning was. Many times I sat back and watched the smiles fly across my boys' faces as I listened to Christmas music and relished in the fact that I was home with my little family! While we could have spent the entire day being lazy with our new toys, we had a flight to catch! Although we wanted to spend Christmas at home, we still didn't want to miss an opportunity to celebrate with family as well. Late that afternoon we jumped on a flight headed to Spokane. That (being the flight) was a bit of a disaster, but that is a story for another post! I hope all your Christmases were as special as ours. Having spent one at home now, I will never do it any other way. I can't wait to have our baby boy with us next year, and to keep starting new traditions and continuing the ones we already have! The CUTEST!!!! Love your house, too, mama! My parents started doing the same thing with us, Christmas Eve and morning were at home with just our family and we visited family afterwards. We live so close to family but I think next year I want to start doing that. There's something special about a low key Christmas Eve and morning with the kids! I love that parking garage for Liam! Where did you get it? I am all for Christmases spent at home! Looks like you all had a fantastic day! Your Christmas post had me smiling the whole time! This. This is what I picture on Christmas. We are always rushing around with the hustle and bustle of trying to be somewhere that I didn't really get to do what I wanted and have a nice quite, movie watching, popcorn eating Christmas Eve spent in jammies. I LOVE that you got to spend Christmas Eve and Day (morning) together and then headed to see your family. Sounds absolutely perfect! How do you get those gorgeous photos of the 3 of you when its just you 3 at home?! I LOVE them! Beautiful family and beautiful tree and home!! I told my family that next year I refuse to leave my house next year on Christmas and I am sticking to that! We had to be 4 places this year and it was too much and has been that way my whole life since my parents are divorced! Isn't it so nice to be in your own home? Next year will be even better with 2 little ones to celebrate with! Woohoo!! Happy new year girl!! Yay! What a great Christmas! We normally travel for Christmas too, but we were just talking about having our own little Christmas morning at home with our new guy next year. Sounds and looks like a magical Christmas, lady! Love the tree and Liam is so darn cute! you have the most adorable little house! SO cute! So incredibly sweet. I totally am with you about starting this new tradition of Christmas in our own home, just us. It was indeed the best Christmas ever. Can't wait until our additions join us next year. It'll be even more amazing! Love those pictures of the three of y'all. This makes me so excited to stay at home next christmas! So happy yall had such a wonderful day! And a white Christmas at that, awesome! 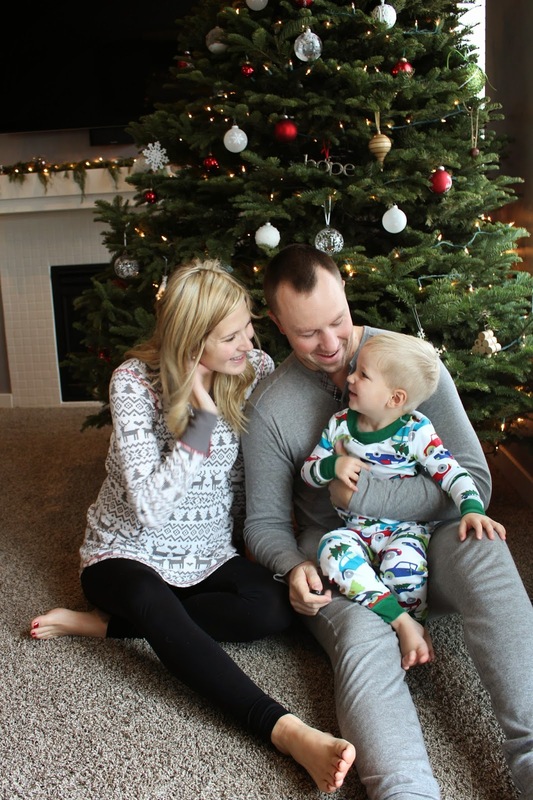 This is so sweet, what a precious Christmas morning with your adorable little family. :) I didn't realize you guys are Catholic? A family picture, Christmas Eve, dressed for Mass is always my favorite.